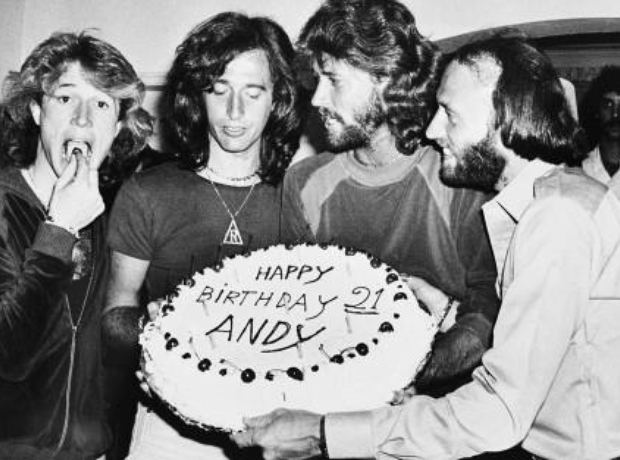 Andy Gibb eats a cherry from his birthday cake at a party given by his family in his home in Miami Beach, Fla., Monday night, March 6, 1979. Andy's brothers, the Bee Gees, from left are, Robin, Barry and Maurice. President Jimmy Carter is shown with the Bee Gees who have done concerts for UNICEF at the White House in Washington on Sept. 24, 1979. From left are, Maurice Gibb, Robin Gibb, President Carter, and Barry Gibb. Robin (left) and Barry Gibb hold their CBEs after receiving them from the Prince of Wales at Buckingham Palace in May 2004. The third brother, Maurice Gibb, died the year before before he could receive the honour and so his son Adam collected it on his behalf.